I've read four of Richard Stark/Donald Westlake's Parker novels now (well, nearly; I haven't quite finished The Mourner yet), and there's a device that Westlake employs in each book, usually two-thirds or so into the story (although earlier in the first novel, Point Blank). Essentially he cuts away from Parker's story – the books aren't written in the first person, but they are largely told from Parker's perspective – and focuses instead on a different character (or characters), one he's introduced earlier in the book. Point Blank contains the most celebrated example of this, where during Part Two we cut away to follow Mal, the Outfit man who's double-crossed Parker, and stay with Mal right up to the point Parker re-enters the story in a surprising fashion. (As an aside, and related to this earlier post, the 1984 Allison & Busby edition of the book slightly fluffs this reveal with an error, substituting a "when" for what had been a "saw". Well done again there, A&B proofreaders.) The Outfit, the third Parker novel, cuts away to follow multiple heists, while The Mourner (Parker #4) leaves Parker for dead before cutting away. 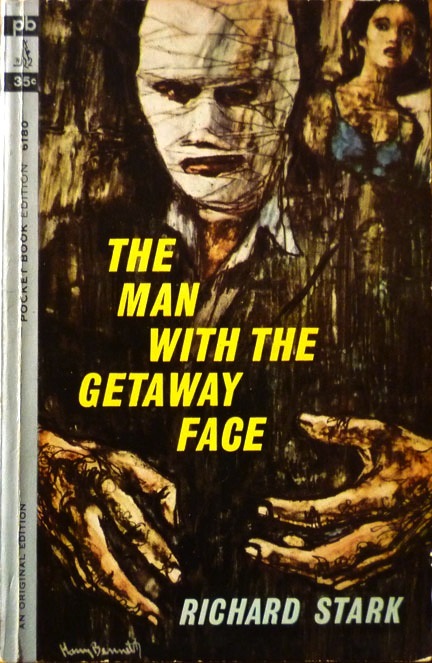 But my favourite cutaway so far, I think, is in The Man with the Getaway Face (Parker #2), and involves the unfortunate Stubbs. In its own way, the switch to Stubbs' story in Part Three is as surprising as the reappearance of Parker in Point Blank. Westlake lulls us into a false sense of security: the heist has gone well, the double-cross even better. And then the rug gets pulled out from underneath Parker's feet and everything goes to pot. End of Part Two. Then we get Part Three, and all of a sudden we're in a parallel detective tale, as we follow Stubbs on a woozy manhunt – woozy because Stubbs is the dumbest detective imaginable. A former Communist Party activist, repeated head injuries have left him in a severely befuddled state. But that only makes him and his adventure more entertaining, as he bumps into dead end after dead end and tries to keep himself on track. And best of all it all leads up to a twist right at the end of the novel that brilliantly deflates the whole enterprise. So that's why I reckon The Man with the Getwaway Face has the best Stark Cutaway (so far, anyway). Oh and that Stubbs story is also so tragic as well! I found it almost difficult to read at points. Westlake was really not pulling his punches at all in the first iteration of the Parker series (that's part of what makes them so great). Wait until you get to the August Menlo cutaway in The Mourner. I think you will find it rivals the Stubbs one, in its own way. Slightly off topic but the mourners are touring the US right now.